This week’s selection was Elizabeth Gilbert’s – Big Magic. I loved this book and our discussion made me think. A big thing I got from Gilbert’s book was -“Don’t let fear hold you back from creating.” Well, I don’t. Or do I? I ‘m constantly creating, working with the kids on projects, working on Wee Warhols… so much that I have to make myself stop and focus on daily chores like feeding my family and keeping a somewhat clean house. But I realized in our discussion that I find it hard to finish my own paintings. I get started full force, then at some point I get scared, wonder if it is good enough, and eventually set it aside feeling intimidated, inadequate. I have a stack of these unfinished canvases as reminders of my failures. How can this be when my job is centered on teaching children that there are no mistakes, only Beautiful Oops? I teach that it is about the process and not the product. I cringe when parents try to guide their children’s work. I carefully choose my words when talking to the children about their work. I like to ask questions. I focus on what the children are doing rather than what the finished artwork will look like. This is huge to me, it is my core teaching style. Yet-when I work on my own art I have a very different voice in my head and it’s not asking positive questions. My inner voice is much more judgmental when it’s looking at my own work. I have always known this was an issue for me. I’ve always focused on realism in my art, and that is less forgiving. I have to really struggle to make an abstract painting, fighting my urge to bring everything back in. I bought an art journal Mess- The Manual of Accidents and Mistakes for this reason. The book sits beside me as clean and tidy as the day it arrived in its cardboard Amazon box. Since I may not be fixable (although I will try), let’s focus on some things we can do to teach our children to be free with art and to not be too harsh on themselves. Don’t worry or even comment about your own artistic ability. This only will make kids question their own. Everyone is an artist. At a young age we are just introducing the children to the materials, so they can become comfortable with them. I try to introduce materials gradually so no one feels overwhelmed. This allows the children to explore at their own pace and get to know the materials. Once they’re comfortable they’ll be more likely to experiment with them on their own. It is a good practice to give one direction at a time for the younger children. That looks like a dog. Is that a train? Color inside the lines (or any sort of criticism). Draw me a pretty picture. In Mona Brookes book Drawing with Children, she lists words that inspire competition: good, bad, better, best. Words that instill frustration or fear of failure: right, wrong, cheat, mistake, easy, hard. Wow, look at all the colors you used! Will you tell me about your drawing? That looks like it was fun to paint. I see thin lines over here and thick lines over there. What would you like to draw today? You really worked hard on this. Ask the child to tell you about the artwork. Ask open-ended questions. Example: What’s going on in this picture? We don’t want to crush their artistic spirit. What we may see as a cloud, may obviously be a knight on a horse to them (at the moment). 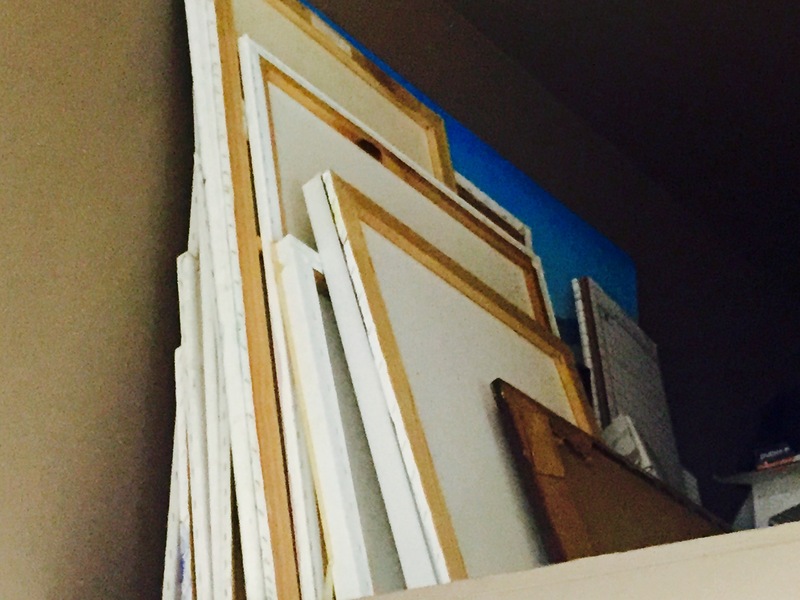 Process Not Product – This means that you can explore art materials and enjoy what happens. You don’t have to copy what an adult makes or even try to make something a friend has made. There is no right or wrong way. YOU are the artist. If you are interested in delving more into this topic I would suggest The Artful Parent by Jean Van’t Hul, Young at Art by Susan Striker, or Preschool Art by MaryAnn F. Kohl. They have been some of my best teachers and influences. As much as I try to teach my Wee Warhols not to be hard on themselves, there is no right and wrong, it is about the experience … It is hard to unlearn and color outside of the lines. Love this!! I totally agree with how to talk to kids about their art! My 3 year old spent all of last year avoiding ANYTHIG art related. Slowly he started picking up pencils because they werent messy. Truly, I think his lack of interest was sensory related. And now that he is a little older and can put meaning behind his hand movements, he’s branching out! The other day he asked to paint a wooden plane with blue paint! He got totally messy and was excited to take a bath after! Huge win! As hard as it has been this past year, I didn’t force it, and am so pleased to say he came around on his own! Pout Pout Fish in the Deep deep Dark is a favorite at our house. We’ve been painting the deep deep dark! It’s awesome because it’s not really a thing! He things it’s so fun!! Thanks Laura, I’m so happy to hear it! I love that idea of painting the deep dark sea! No pressure, just painting. What a good practice to build confidence and get used to the feel of things. Brilliant. I may have to try that out with kids that come to my class and may feel the same way your son did. It may have been a struggle this past year, but you seem to have things figured out. Parent win! I Love this idea! Can you tell me more about the book club. I’ve never been in a book club, but like the idea of inviting friends (moms) to become a part of a book club that can be focused around becoming more creative, etc. Do you have a book list, etc.? Hey Erin. My super creative friend Jennifer Perkins came up with the idea. In her words,”Book group focusing on motivation, creativity, mental oomph, life improvement, courage and more. Meets once a month to discuss current selection.” She created a closed FB group and invited a group of friends she thought might be interested. This is most of our 1st times being in a book club, so we are winging it. I am loving it, especially since I have been listening to the books on iTunes. I feel super accomplished, since I am multitasking. We started with Big Magic and we meet again at the end of the month to talk about A Curious Mind: The Secret to a Bigger life. We have used the two links below as resources to choose books from. I couldn’t agree more with what you said. It was that competitiveness, that distinction between what is good and bad that I experienced in school that scared me away from painting and drawing for the longest time. My daughter sometimes is asking for the good – bad – what is best – judgement and I always try to avoid that distinct answer. I will say things like “I like this picture a lot because here you did X and Y”. Thanks for sharing your thoughtful ideas. I also just finished reading “Big Magic”. It is was so good. Right, Christiane? I thought it was very inspiring.